Home › Debate › Robertson, first place in the interhouse debate event! Robertson, first place in the interhouse debate event! Last Thursday, Mackay third and four medio students faced each other in the Inter house Debate Event, which took place at the auditorium and audiovisual room in the form of simultaneous debates. In the audiviosual room the motion was “this house would legalize the sale of human organs”. The Somerscales team represented by Matthew Faille, Magini and Dan Eidelstein was side oppostion and faced the Mackay team represented by Joaquín Oporto, Sebastián Barriga, and Mingi Park. After a very difficult decision by the judges the Sommerscales house came on top moving to finals. At the same time at the auditorium and with the motion “this house believes stray dogs should be put down”, Roberston house represented by Vicente Gándara, Martín Macchiavello and Rodrigo Jeria opposed to Thomas Reynolds, Nicolás Gastó and Joaquín Rodríguez in representation of the Sutherland house. After an entertaining debate, Robertson house moved to the finals. 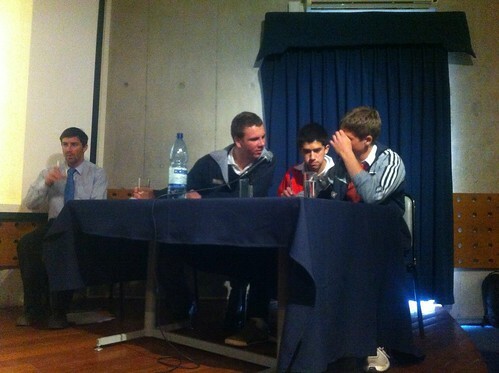 The semi finals were held in the audiovisual room with the motion “this house would make the minimum drinking age of 21” and Mackay house was side opposition. After a long debate, Sutherland house presented strong arguments and beat the side opposition awarding the 3rd place in the English Inter house Debate. The finals were held at the auditorium between Roberston and Somerscales and the motion was “this house believes that if there were no guns there wouldn’t be wars”. The judges went with Roberston house, awarding them with the 1st place in the English Interhouse Debate Event! Congratulations to everybody especially to Robertson!